I recently gave some advice to a student pilot on another forum (www.askacfi.com: base-to-final turn). The advice included, among other things, the suggestion that the turn from final to base leg should be planned for 20° of bank. The reasoning was that steep angles of bank lead to high load factors, which in turn increases the stall speed—potentially bad news when operating at the low speeds and low altitudes associated with an approach to land. Planning for a 20° AOB for the turn allows for a 10° margin to correct for misjudging if we wish to limit ourselves to 30° AOB under these conditions. 30° is a good limit to use since the load factor and stall speed increases up to that point are slight. But they increase rapidly at steeper bank angles (1.15g at 30°, 1.41g at 45°, and 2g at 60°, all corresponding to 7.5%, 19%, and 41% increases in stall speed, respectively). So the question from all of this is, "What difference does it make what angle of bank I use?". The difference is in the radius of the turn. The turn radius indicates how much space the turn takes, and therefore how much we need to lead the turn in order to roll out on a specific track. We have to lead the turn to final in order to roll out on the extended centerline of the runway. This means we have to anticipate how much space the turn will take, and to manipulate that spacing during the turn if we misjudge. This is one situation where the relationship between airspeed, AOB, and radius of turn becomes important. Because we can't have a zero-radius turn (which would be a perfect corner on our flight path), we need to anticipate the space we take up when trying to turn onto a target track—such as when turning final and aiming to be on the extended centerline of the runway. If we turn too late, we'll fly through the centerline. If we turn too soon, we won't reach the centerline. In practice, we normally control the radius of turn with angle of bank. Theoretically, we could also change airspeed, but our airspeed is usually constrained by other considerations—such as our selected target airspeed to use for the approach: too low and we risk stalling, too high and we run into landing difficulties. So a higher AOB will get us a smaller turn radius, and a lower AOB will get us a bigger turn radius. Of course, this is only useful if we have the option of increasing / decreasing the AOB. Decreasing AOB is easy—we can always fully or partially roll out of a turn to widen the radius. 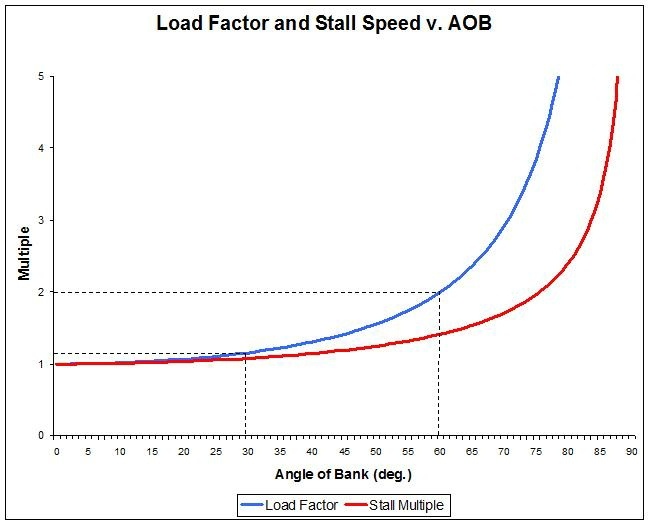 Increasing AOB, however, can be problematic if we are trying to limit our load factor (and the corresponding stall speed increase). To allow for an increase in AOB to compensate for any misjudging that might occur, we need to plan the turn at an AOB that is lower than our selected maximum AOB. This is where the 20° rule comes from. Planning for turn radius when turning final is often a problem areas for new multi-engine students. Because they are now operating at an airspeed that's higher than they're used to, they have trouble leading the turn-to-final adequately. the correction in this case, until the student has fully adapted to the new increased operating speeds, is to reduce the AOB once in the turn to final and turn judgment improves. It's also worth noting that rate of turn is closely related to radius of turn. In many situations where we don't need to roll out on a specific track, we're often more concerned with rate of turn than with radius of turn. Luckily, the parameters are the same: airspeed and AOB. Lower airspeed and higher AOB correspond to higher turn rates (and smaller radii). Higher airspeed and lower AOB correspond to lower turn rates (and higher radii). There's a rule of thumb here that works well below about 200 knots: AOB for a "Rate-1" turn (3°/s) is 10% of your airspeed plus 7 (if you're working in knots) or 5 (if you're working in MPH). Read about the power curve and it's application to fight operations. Check out my post, The Power of the Power Curve, published in the resouces section of www.aviationschoolsonline.com. Stick-and-Rudder skills are perhaps the most important skills a pilot has. Without good stick-and-rudder, a flight will be, at best, inefficient, and at worst, dangerous—even to the point of being fatal. Further, stick-and-rudder skills are the only skills that really must be learned in the aircraft. Classroom instruction and home study may help a little. But ultimately, you have to get in the airplane and do it in order to learn the skills. This is distinct from other important skills like flight planning, navigation, weather assessment, and decision making—all of which can be learned largely on the ground and then fine-tuned in the airplane. Educators may note that stick-and-rudder skills fit squarely into the psychomotor domain of Bloom's Taxonomy. Dutch Rolls involve rolling the aircraft back and forth between two opposing bank angles while maintaining a steady heading. The difficulty is in using the rudder effectively. Initially, because of adverse yaw, pro-roll rudder is required. But as the bank angle is established, opposite rudder is required to hold the heading. Upon reversing the aileron, further rudder adjustment is required. The value of this exercise is in learning the coordination of rudder and aileron—even though you are deliberately uncoordinated for much of the maneuver. You learn how to control the attitude and the movements of the aircraft very effectively, and you learn how to cross-control effectively—which will set you up nicely for crosswind landings later on. The difficulty varies with roll rate, so try the maneuver at various roll rates and angles of bank. Also, try the maneuver in different configurations, and in cruise, climbs, and descents. Every pilot has done steep turns. Rolling in to, maintaining and correcting, and rolling out of steep turns is part of the basic skill set taught early in pilot training. But Steep Turn Reversals bring the difficulty level up a notch. Rather than returning to wings-level and neutral rudder to roll out of the turn, keep the roll going to a turn in the opposite direction. Steep Turn Reversals carry on the lessons of the Dutch Roll, with the new twist that you want to stay perfectly coordinated throughout the maneuver—so you want the ball centered at all times. Maintaining a fixed heading is not the goal here (as it was with the Dutch Roll). Maintaining coordination is. Try the Steep Turn Reversal at different roll rates and with different angles of bank—up to and including 60°. I've talked about the Falling Leaf Stall before (right here in Fall Like a Leaf, Grasshopper). For the Falling Leaf, simply enter a stall and, instead of recovering, stay in the stall while preventing a spin. The Falling Leaf is a great way to learn about the stalling characteristics of your aircraft. Further, it's a great way to learn rudder control in and around the stall, and to train yourself not to use ailerons in the stall. Try the Falling Leaf in a variety of configurations and with a variety of power settings. As a safety note, don't risk entering a spin (even inadvertently) in a configuration that is not certified for intentional spinning. Slow Flight is the operation of the aircraft at speed lower than best endurance but above the stall. We often refer to this speed range as the "Region of Reversed Command" because of the increase in power requirement as speed is reduced. In this speed range, we experience a number of notable aircraft behavior changes, including: increased adverse yaw, increased lift asymmetry in a turn (i.e. - the tendency to overbank), reduced control forces, increased left-turning tendencies, speed instability, and a requirement for more power at lower airspeeds. Combined, these new (or more pronounced) characteristics make flying the airplane precisely much more of a challenge. Simply entering and exiting Slow Flight is a good start if you're new to the exercise, but don't stop there. Be sure to include maneuvering in Slow Flight. Conduct turns, climbs, descents, and climbing/descending turns. Also, don't set one airspeed, learn to operate the aircraft throughout the entire Slow Flight speed range. The airplane only sees airflow. Our visual cues come from the ground. The difference can be critical and is more pronounced in high winds at low altitudes. Visual illusions caused by our interpretation of track/groundspeed as heading/airspeed can be very convincing, and have caused fatalities in the past. Low-level Ground Reference Maneuvers can help us learn to defeat these illusions and fly the aircraft more accurately. Ground Reference Maneuvers include turns around a point and pylon eights. But if you're new to Ground Reference Maneuvers, keep it simple at first—try tracking along a straight road in a crosswind, then try flying a square or rectangular track (preferably following some visual reference like a set of roads). The crosswind takeoff requires us to transition the aircraft from uncoordinated operation (while rolling on the runway) to coordinated flight with a minimum of fuss. We have changing roll inputs to prevent rolling over on the runway as our speed changes. We have changing yaw inputs to remain straight while on the runway and to eliminate the slip once we're airborne. And we have changing pitch inputs for the takeoff itself. Conducting crosswind takeoffs in a taildragger is especially good for developing stick-and-rudder skills. Opposite to the crosswind takeoff, the crosswind landing requires us to transition from coordinated flight (on approach) to uncoordinated operation by the time we're on the ground. In practice, we usually enter the uncoordinated phase very late in the approach (ideally just before touchdown). But in training, the transition is often made earlier in order to reduce the workload during the learning process. The maneuver requires us to maintain a track (along the extended runway centerline) while correcting for the crosswind—this means "crabbing". Near the runway, the "crab" is replaced with a slip so that we can touchdown with the wheels aligned with the runway. So we see coordinated track corrections followed by uncoordinated aileron-rudder cross-control, which is immediately followed by pitch inputs for the roundout and flare. Conducting crosswind landings in a taildragger is especially good for developing stick-and-rudder skills. The aileron roll doesn't require a whole lot of precision—which is why it's usually the first type of roll taught to new aerobatic students. But it does build a pilot's exposure to extreme attitudes, and therefore enhance our ability to maintain orientation and precise control throughout the entire maneuvering envelope. It also serves as an excellent warm-up for slow rolls, discussed next. In principle, the loop is a very simple maneuver. But flying it well requires a degree of precision not required in "normal" flying. Because you lose sight of the horizon during the initial pull-up, it's difficult to make roll corrections until you can see the opposite horizon again (at around the 120° point of the loop). This lack of good correction amplifies any bank errors on the entry. So a good loop—although it is primarily a pitching maneuver—requires excellent bank attitude control on the entry. This, combined with the exposure to extreme attitudes, is what makes loops such a great skill-builder. A well flown Slow Roll can look very easy. But, as is often the case, looks can be very deceiving. The well flown Slow Roll requires proper—and often counterintuitive—coordination of all three primary flight controls. Aileron is used to roll the aircraft. Rudder is used to prevent a turn initially, and then to maintain a pitch attitude at very high angles of bank. And elevator is used to maintain a pitch attitude and to prevent a turn at very high angles of bank. The rudder moves from neutral to opposite the roll, back to neutral (when you're inverted), and then to pro-roll. The elevator moves from slightly back for cruise, to neutral at 90° bank, to well forward when inverted, back to neutral at 270° bank, and back to slightly aft as you return to cruise. The rate at which all of these changes take place depends on the amount of aileron used—and therefore the rate of the roll. With all these goings-on, one can imagine how perfecting the slow roll will help you learn to coordinate all three controls to precisely control attitude and direction. Way back when I was a student, we often (always?) used the term "downwind check" for what I now call the "pre-landing check". The "pre-landing check" or "before-landing check" terms are pretty standard phraseology among commercial operators. But the "downwind check" term still seems to show up among private pilots and at flight schools—even those that train a large number of new commercial pilots. I'm pretty picky with my own students—especially instructor candidates—and insist that they use "pre-landing check", just like I insist that they use "pre-flight inspection" instead of "walkaround", and "landing area" instead of "field" for forced landings. Why worry? They all mean the same thing, right? I don't think so. There have been documented cases of pilots landing without doing a "pre-landing check" because they flew a straight-in final—no downwind leg, so no downwind check. I've personally witnessed a student ignore a perfectly good paved runway within gliding range during a forced landing because he was looking for a "field". Pre-flight inspections tend to be under-taught and under-done, in part because we often don't refer to them as "inspections", which is a term that drives home the whole point of the exercise. The point here is that the terminology we use carries secondary messages, or connotations, that we may not intend. "It's just semantics, so don't worry about it", or words to that effect, is a response I've occasionally received from doubters. But they miss the point that semantics is the essence of communication, and communication is the essence of instruction. We need to be aware of—and to control—the mesaages we're sending students. This includes the subtle, hidden messages in the connotations of our words and phrases as well as the direct, literal messages we send. If a check is to be done before landing, then it's title should reflect this. If a sequence of actions are intended to inspect, then it's title should reflect this. If we're not necessarily looking for a "field", then the term/phrase we use shold reflect what we are looking for. This clarity of communication isn't just for instructors. Pilots in general need to be able to communicate clearly and concisely in order to operate safely and efficiently. We're helped along by the use of standard phraseology. But unfortunately, some of the standards and commonly accepted conventions need a little re-thinking. So the next time you want to do a "downwind check", ask yourself whether you, your crew, and your passengers might be better served by a small change in language. Well, it's that time of year when the days are shorter and the nights are longer: perfect conditions for night flying, or, if you've never flown at night, night training. This is also an excellent way to scrape the rust off after the Xmas break. Of course, winter solstice has passed, so the days are already gradually getting longer (and the nights shorter!). So, if you want to take adantage of the extra darkness, now is the time! Why fly at night? Well, aside from the sheer joy of it, night flying is an excellent skill builder. If you're working on a night rating, your aircraft control, instrument useage, and positional awareness will all improve. If you have the rating and are simply using it, the benefits you recieved from your original night training will now be used, refined, and improved upon. Remember when flying at night that you need some extra instrument crosscheck—especialy over featureless terrain with little or no artificial lighting. Although the attitude indicator is not a legal requirement for night flying, I think it would be unwise to launch without one. If you're working with an instructor on your night rating, make sure to see the syllabus plan he/she has for you. Look for specific learning objectives (and exercises to reach those objectives) on each lesson. Don't just fly the hours to put time in your logbook and get signed off. Instead, get your money's worth out of the training, and make sure there is a plan to follow.